Low voltage landscape lighting sets were the best method for safe lighting before ultra-bright LED lamps, inexpensive rechargeable batteries and small solar panels. Since landscape lighting doesn’t need to be very bright, low wattage bulbs or low voltage lighting may be used as a good source of light. Typically a less expensive lighting choice, low-voltage lighting uses a step-down transformer to change your home’s 120-V electrical supply to 12 V for light illumination. This power conversion makes this lighting system safe to install and maintain. Because the wires are not high-voltage they can be placed just underneath the soil. If you need to move the lighting around for a landscape redesign, the wires can be easily relocated. 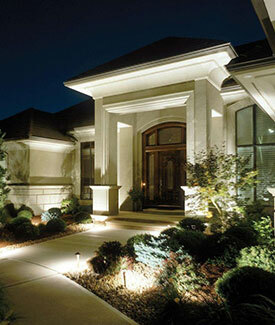 Low voltage landscape lighting comes in sets. Each set needs to have its own step-down power transformer. A transformer powers a designated number of lamps. Most lighting designs & installations require multiple sets of lamps & transformers. For most efficient operation all lamps in a set should be used. 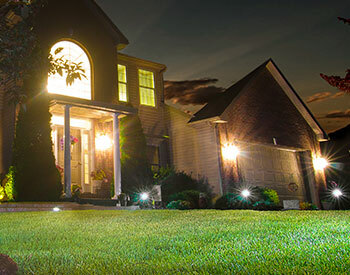 The main advantage of low voltage landscape lighting is that the energy needed to light a bulbs filament is much less. Bulbs can be made smaller to fit into smaller fixtures. Low voltage landscape lighting allows for using smaller light fixtures, and this creates more options for fitting light fixtures into smaller spaces. There are a few disadvantages to low voltage landscape lighting. Although you might think that low voltage means using less electricity and savings on your energy bill this may not be completely accurate. Additionally like any equipment you will have failures. Transformers, bulbs and even the lines will need to be repaired or replaced. Our long list of satisfied clients confirms we are Southwest Florida’s leading low voltage landscape lighting company. Fully licensed, bonded, and insured, Coastal Outdoor Lighting design professionals and technicians offer a variety of solutions to meet the demands of Florida’s outdoor environment. Your designer can walk you through our catalog of products to find the perfect lighting solutions for your business or home. To schedule a “FREE” Onsite Consultation complete our online request form or for the fastest response call us today at (239) 491-6759.